Resources are an important part of building a vibrant and democratic organisation. A panchayat level initiative of Gram Panchayat Chitoriya has set a new and much needed trend. The units in Mohanpur and Chitoriya had been facing a lot of trouble at their local PDS outlet (ration shop). They were like in villages all over Bihar being given less ration and being charged more. In a local attempt to set things right saathis decided to sit-in at their local shop till right amounts at right prices were distributed. The SDO was supportive and on one such occasion the BDO visited to ensure fair distribution at correct rates. At the fifth shop the response was again the same resistance. So this time residents of Chitoriya decided to collect donations from the entire village and send them to the Government to let them know that workers too had dignity and would not take rations as a dole but only as their right! 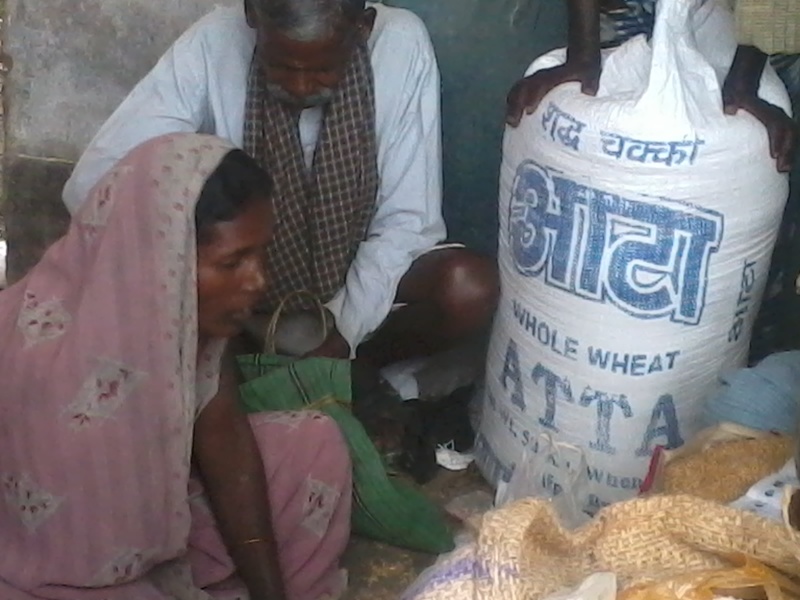 A collection of over 200 kgs of wheat and rice was made on 6th October, 2013. Since the PDS dealer did agree to the people ‘poora ration, sahee daam, accha maal”, this ration was by an understanding given as a donation to the sangathan. In another attempt to raise resources locally… for every old person going for the pension parishad an amount of 400 rupees will be collected at the village level to support their travel costs and the elderly going are committing one month of their time to stay at the indefinite sit-in. 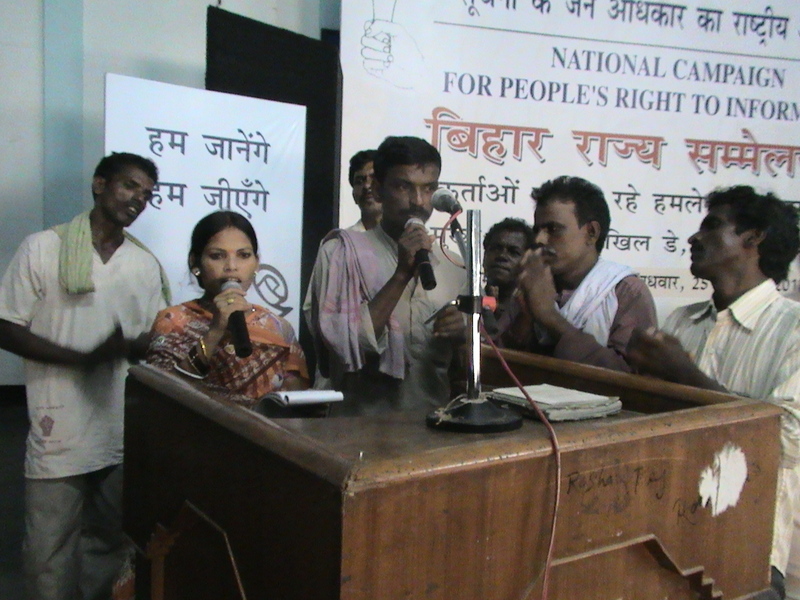 First State Convention of the NCPRI in Patna on 25th September, 2013. The JJSS Cultural Team in Action! As before the JJSS continued to support the initiatives of the larger campaigns it is involved it including NAPM, NCPRI, Right to Food and interacting with other organisations. This included organizing the NCPRI State Convention on 25th Sep, 2013. A Bihar based group SAHAJ sent its team to experience the work being done in the JJSS areas. kamayani represented the JJSS at the TISS, making a presentation on “NREGA as a means of transforming LIvelihoods”. Ashish and kamayani were also part of public hearings in Darbhanga and Bhagalpur districts as part of the National Rural Health Mission (NRHM). 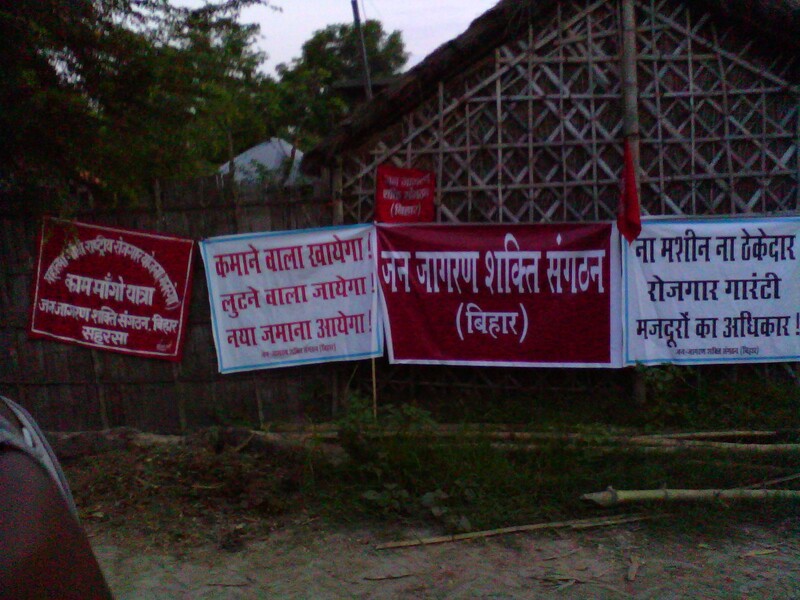 The JJSS continues to extend its support to saathis in Muzaffarpur who were on a 21 day sit-in, in which Jitendra and Shivnarayan participated with their cultural team. 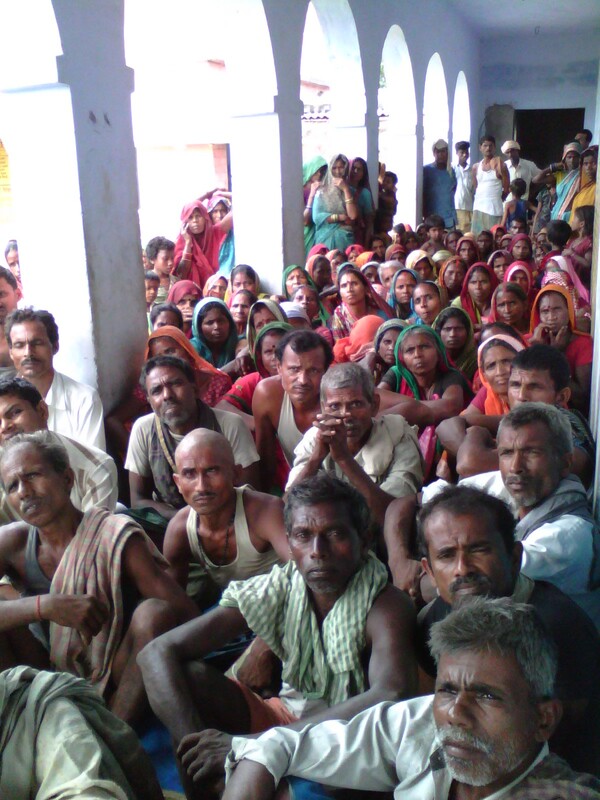 The JJSS also coordinated the ICDS social audits done in Khagaria district as an initiative of the ICDS Directorate. 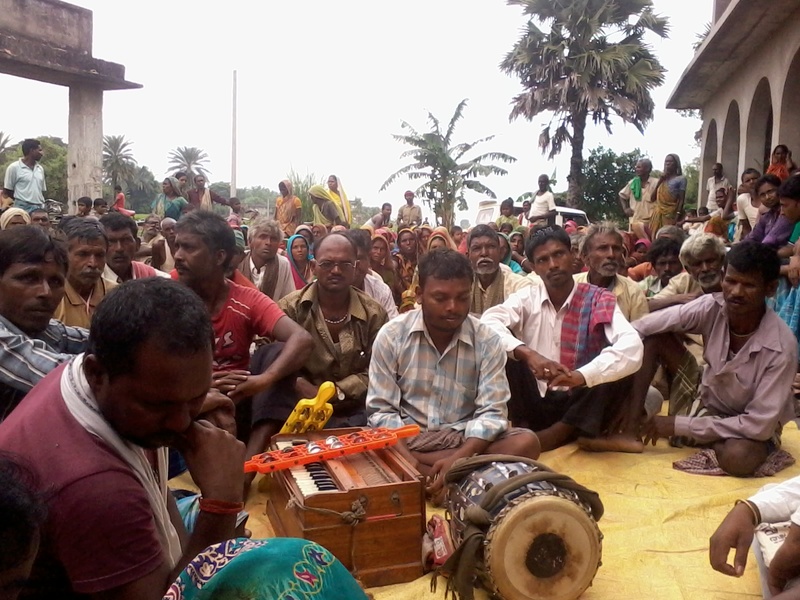 Working with Maoranjan Jha Memorial Trust in Saharsa : JJSS along with Manoranjan Jha Memorial Trust launched a campaign on MNREGA in the month of June 2013 in three Panchayats of Raj Sonbarsa Block of Saharsa. Manoranjha Memorial Trust is run by Ashish ji’s family and it was felt in the village (Amrita) that MNREGA money was being siphoned off at large scale and people were not getting work. The campaign started with a Padyatra involving local people, student volunteers who had come to intern with JJSS and JJSS saathis. Arvind who had joined the Pension Parishad campaign in Patna did the ground work of the Padyatra and made sure that the block administration were aware of the developments. The Padyatra was a good start to make people aware of their rights on MNREGA. Rozgar Sevaks of all the panchayats covered in the Padyatra attended the public meetings and accepted demand for work and Job Card. Response of the people of the area kept the team lively and energetic who had to bear tough conditions and at times had to go hungry when they could not get food in the village.